Here are top 7 ANC in-ear models that have the best noise cancelling technology. Use them for traveling or just enjoying your music in peace. Compare the models to each other in the table below. …or you can check the currently available offers by clicking on links in the comparison table. Are you looking for passive noise isolation headphones? Take a look at best noise cancelling headphones (over-ear, on-ear). Compare earbuds with the most effective noise cancelling technology and choose the best for your needs. Noise Cancelling vs Noise Isolation – Is Noise Cancelling Better? What Can You Expect From Noise Cancelling Headphones? What Does Active Noise Cancelling Up to 95% Actually Mean? What Are Your Favorite Noise Cancelling Earbuds? There is a lot of misconception about noise cancelling and noise isolation. Here we’ll explain the difference. Noise cancelling also known as active noise cancellation is a powered system that requires a microphone and a battery to function. The microphone picks up the surrounding noise and sends the opposite frequency to the headphones to negate the unwanted noise. This works nicely for constant, low frequency sounds like the constant engine noise. When active noise cancelling is on it feels like you’re in a quieter place, but it does not cancel out all noise. The sound of human voices, loud music and every other, non-constant frequencies won’t be cancelled out and you’ll still hear them. Usually the combination of active noise cancellation and passive noise isolation offers the best results. Passive noise isolation is a more basic concept, but very effective nonetheless. It uses no batteries or microphone, just simple noise blocking by isolation. For over-ear headphones the use of tight fitting ear pads plays a crucial role in blocking out all external noise. For in-ear monitors, using double or triple flanged ear tips usually gives the best results. You can find great noise isolating earbuds here. Good noise isolating headphones will block up to 37 db of noise which means, complete isolation from normal conversation volume, especially once you play some music. Passive noise isolation blocks all outside sounds, from neighbors to loud kids. This makes them very useful when you just want to have some peace and quiet without being bothered by the outside world. On the other hand, complete sound isolation can be dangerous in public places, like walking on the street when it’s good to know what is going on around you. Noise cancelling headphones will get rid of most background noise without cancelling higher frequency sounds like human voices and street traffic. Once you press the button to active noise cancelling, part of the background sounds will just disappear, making the illusion of a quieter environment. Noise cancelling headphones are best for traveling since you want some quiet time, but at the same time hear any important information regarding your flight, train schedule or just hearing an approaching car on the street. All ANC (active noise cancelling) ratings represent a measurement at best possible conditions. Usually, the effectiveness of noise cancelling is measured at specific, low frequency and lower volume conditions, since this is where ANC is most effective. It doesn’t mean active noise cancelling headphones with 95% rated effectiveness will cancel out 95% of background noise. They will cancel various frequencies at different levels. Take the ANC ratings with a grain of salt as these don’t represent the exact behavior and effectiveness of the noise cancelling technology. Bose QuietComfort 20 are the best noise cancelling earbuds, bar none, on the market right now. Some might not like Bose products, but when it comes to sound cancelling, they are the best in business. It’s a fact Amar Bose and his company first offered noise cancelling headphones to the public. With QC 20 not only do you get the best active noise cancellation, but also very comfortable, durable and good sounding earbuds, all in one package. If you want to magically delete the background noise and just enjoy the music while still hearing higher pitched sound, Bose QuietComfort 20 are the best audio equipment for this job. With the combination of good passive noise isolation and best in class, active noise cancelling, you won’t find better earbuds. It seems noise cancelling works better even for higher frequencies than with competitive ANC (active noise cancelling) headphones. They are so good, these earbuds won’t just remove the humming sound of plane engines, but also parts of street traffic, human conversation and bird chirping. They don’t completely cancel these sounds, but do it better than any other earbud model out there. Additionally, these have a special feature called, Aware mode, which lowers the level of noise cancelling for cases when you need to hear the people around you. It works nicely and it’s as simple as pressing a button. Click on a button to activate it, and click again to deactivate, it works like magic. The battery needed for noise cancellation is unfortunately not replaceable, but has about 16 hours of battery life (USB charging), which is quite good. Since it’s a lithium ion battery it is good for about 500 full charges, after which the capacity will start to diminish. If you’re a heavy user, like 10 hours per day on average, you can expect a good year and a half of use out of them. 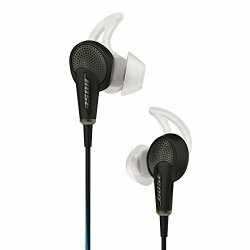 Bose QuietComfort 20 got the Travelers’ Choice Award 2015 for being the best noise cancelling earbuds. Build quality is good, even if earbuds are made of plastics. The silicone ear tips are well made and provide a tight fit. Cables are protected by a nice amount of rubber and there seem to be no major weak points in the design. Because of their lightweight design and quality silicone ear tips, Bose QuietComfort 20 are very comfortable. …but they do a very nice job. With the combination of “wings” that you attach to your ears, the fit is very stable and comfortable at the same time. They aren’t the most comfortable earbuds in the world, but pretty close. Passive noise isolation is quite good as well, especially once you find the proper size of ear tips. The microphone is positioned on the cable and works like intended, you can comfortably make calls without interruptions. The controls are conveniently placed and you’ll get used to them very quickly. You can control; play/pause, next/previous song and ANC on/off, plus the button for Aware mode (just make sure to buy the right OS model – iOS or Android). There are also older, cheaper Bose models that have equally good noise isolation if you don’t want to pay the full price. Want headphones for swimming? Click here to find top waterproof iPods. Sound quality is very good for noise cancelling headphones, but obviously, can’t compare to regular, audiophile models. It seems the sound is better when noise cancelling is on, compared to when it’s offline. The mids are usually more recessed in the latter case so it makes sense to always use ANC (active noise cancelling) mode if possible. Generally the sound is still very “Bose-like”. With emphasized bass and treble slightly overshadowing mids. Yet the sound seems more balanced than with previous models, these have better mid-range than any noise cancelling Bose earbuds before. There isn’t much soundstage, like with most earbuds, and there is also that slightly hearable hiss that noise cancelling technology produces. In the end, sound reduction more than makes up for it, so it’s not really such a big deal. If you value awesome noise cancellation before sound quality (awesome for frequent travelers), you’ll love these, even if the price is a bit steep. You get what you pay for. 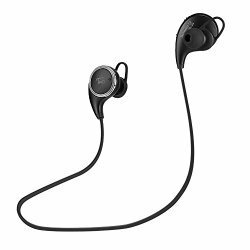 In the end, if you want the best possible noise cancelling technology packed in a small, comfortable earbud design that produces good sound quality, Bose QuietComfort 20 are the earbuds for you. AKG K391 NC are another good choice of noise cancelling earbuds. With slightly different features and specs, and especially for a lower price, you’re getting a great pair of ANC in-ear monitors. If we compare these to the level of noise cancellation of Bose earbuds above, AKG K391 have some catching up to, but still offer above average noise attenuation. For use on the plane or busy public street these earbuds will provide you with good noise cancelling. You’ll still hear higher pitched sounds while the “white noise” and other background hums will disappear. The battery life is even better than with Bose, as these will deliver up to 40 hours of playtime (more around 35) on one battery charge. This offers even more flexibility for on the go use. Made out of aluminium, the build quality is top notch. From aluminium earbud casing, thick, rubberized cables to aluminium plated battery and ANC box, you’ll have a hard time finding more durable noise cancelling earbuds. This is to be expected, as AKG is well known for making high-quality products and not skimp on build quality. 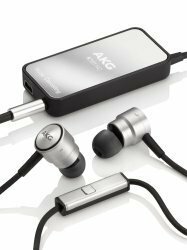 AKG K391 NC have a more standard in-ear design than the Bose QuietComfort 20 that are closer to on-ear earbuds. They stay in ears as long as you don’t do any fast movement, they really aren’t meant for working out. The ear tips can be replaced with better, foam ones to improve comfort, even though original silicone tips aren’t that bad. Expect average IEM comfort level, not too bad, but not great either. If you’re used to wearing IEMs, these will be comfortable for you. The microphone works nicely for making calls and you can connect the same pair of earbuds to both, iOS and Android devices. Don’t expect studio quality recordings, but more like enough quality for talking to your mom. The bad side of big battery pack is portability. You always have to carry the battery and ANC box with you, so this can be one of the bad sides of noise cancelling technology. All audiophiles will agree that AKG K391 NC sound better than Bose SoundQuiet 20 and that’s because the sound is more balanced. With Bose you get emphasized bass and treble, but the AKG has a much flatter sound signature. It still can’t compare to non-noise cancelling headphones, but it’s definitely closer. With ANC off, the sound is muffled and lacks details, but once you turn it on, it dramatically changes. Highs are clean and defined, more on a warmer side. Midrange is not overshadowed and plays its role properly. The best part is the bass, it’s not boomy and deep, but rather tight and punchy. Overall AKG K391 have balanced sound without any major lacking points, of course, considering these are noise cancelling earbuds. If you don’t want to spend the steep price of Bose QuietComfort 20, but still want high-quality noise cancelling earbuds, AKG K391 are one of the best possible choices. Phiaton BT 220 NC is the best Bluetooth noise cancelling pair of earbuds right now. This is the upgraded version of already good Phiation PS 210 BTNC model which you can still get at a lower price, but with slightly fewer features. For those of you who know a little bit about noise cancelling, you’ve probably already heard of Phiaton. This company is well known for making top quality ANC headphones. 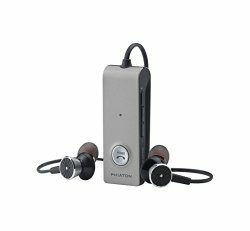 With Phiaton BT 220 NC the noise cancelling circuitry is packed in a small box where you can also control music, ANC activation and Bluetooth connection. Noise cancelling is supposedly even better than with older version, as it will block up to 95% of all noise. While these are nice numbers, Bose QuietComfort 20 still have a slight edge in this regard (especially cancelling higher range sounds), but for a higher price and with lower sound quality. Phiation doesn’t produce such noticeable hissing sound most other ANC headphones do. This is something other manufacturers have yet to learn. Battery life is good with around 16 hours, depending on how much you use the noise cancelling technology. You can also use it with NC off and you’ll get more juice out of the battery. Bluetooth 4.0 works pretty much like the older versions, not much improvement there. So you can expect about 30ft of range without obstacles in between. The good thing about these is that you can use them in various ways. Either with Bluetooth and ANC, or you can connect them with a micro USB cable and use them as regular wired earbuds. You can also use noise cancelling without any music if you just want some peace and quiet. When it comes to durability, these aren’t anything special. They are still well built, but aren’t resistant to sweat or have a lot of aluminium in them. They are made mostly out of plastic, but this makes them very light. In the end, you should treat these just like any average earbuds and they’ll survive for a long time. Because of their lightweight design, these are very comfortable. Once you find the right size of ear tips you will often forget you’re even wearing them. In any case, you can change the ear tips with better ones if you want, like foam Comply tips that are considered as best in class. With Bluetooth 4.0 and AptX you also get NFC connectivity, a microphone (only works in Bluetooth mode) and multipoint connection, basically meaning you can connect it to 2 devices at the same time. The sound is very good, probably even better than with Bose QuietComfort 20, but only if you appreciate the balanced sound. Bose has more bass and Phiaton a more even reproduction of all ranges. The highs are very crip and detailed, midrange isn’t overshadowed and the bass is punchy, but definitely not emphasized. For bassheads, this isn’t the right model. The only problem, that all noise cancelling headphones have, is that strong wind will still make a mess of the sound when NC is on. This is one of the disadvantages of noise cancelling technology. In the end, if you’re looking for comfortable, affordable, noise cancelling and Bluetooth earbuds with great sound quality, Phiaton BT 220 NC is your best choice. Sony MDRNC13 are the newest noise cancelling earbuds from Sony. Their slightly different design gives them some advantage over the competition. Noise cancelling technology is less effective than with Bose or Phiation earbuds above, but works nonetheless. Just don’t expect too much, Bose do cost much more money after all. These are perfect if you want some noise cancelling, but still want to hear sounds around you. According to Sony, they cancel up to 87% of noise. What Sony MDRNC13 are really great at, is battery life. With changeable, regular AAA batteries that last up to amazing 100 hours of listening. No noise cancelling earbuds can offer that. Durability-wise these are well built out of quality plastics. You can’t exactly go to the gym with them and expect them to survive for long, but for regular, everyday use they are perfect. This is Sony after all so you won’t find any major durability issues with this product. Earbuds are quite large, but since they are made out of plastic, they don’t weight much and offer a comfortable fit even on a long plane flight. Picking the right size ear tips is crucial, just like with all in-ear monitors, bigger ear tips will offer better passive noise isolation, but smaller ones are more comfortable and less irritating over the long run. Sony MDRNC13 don’t have a microphone for making calls, but will work with any smartphone or tablet. They are easy to drive and as long as you have a place for the noise cancelling “box” in a close pocket, you’re good to go. Sound quality is very “Sony-like”. It’s not exactly high audiophile standard, but better than average. The highs are crisp and the bass is somewhat present, but definitely not deep or emphasized. Overall it has a balanced sound that can be enjoyed on the go, just don’t compare these to higher end earphones. 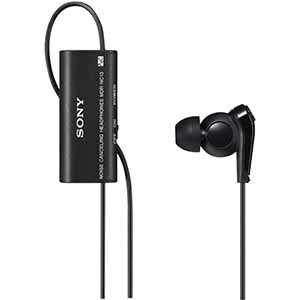 If you want quality Sony noise cancelling earbuds with amazing battery life, then Sony MDRNC13 are a great choice. …and not without a reason. In our opinion, these are the best value for money noise cancelling earbuds right now, period. For under $100 you’re getting durable, noise cancelling earbuds with a high-quality sound that is better than many $200+ ANC (active noise cancelling) earbuds. According to Audio-Technica, these earbuds cancel up to 90% of noise. Real life effectiveness confirms this. These have one of the best noise cancelling effectiveness that can compare even to Bose QuietComfort 20 and Phiaton earbuds. Put them on, turn on the noise cancelling and enjoy the magical “disappearance” of all annoying noise. You can still hear people around you, but just enough to know if someone is calling you. The battery life is great at around 60 hours with one AAA battery that’s stored in the attached casing. Having a changeable battery gives you a lot of flexibility. If it suddenly dies on you, you can easily replace it with a new one, no need to recharge. Since these are Audio-Technica earbuds, build quality is very good. They are made out of plastic, but the high-quality kind that doesn’t break down in a few weeks. On the other hand, don’t use these for sports as you’ll most likely have a problem with the noise cancelling “box” attached to the cable, plus sweat will probably kill these sooner than later. You can find top headphones for working out here. Audio-Technica ATH-ANC23 are lightweight IEMs with a bulky design. This doesn’t make them uncomfortable, in fact once you find the proper size of ear tips these are as comfortable as any other in-ear monitors. Because of low weight, earbuds don’t pull down, so when they fall out, it’s more of a coincidence. The earbuds don’t have a microphone for taking calls since mics are integrated into earbuds themselves. You control noise cancelling, called QuietPoint, with controls on the “box”. It is as simple as pressing a button and you get transferred to a more peaceful place. This is where Audio-Technica are really good, especially considering the price. These are one of the best sounding noise cancelling earbuds. They are rather midcentric, but only to a small degree. The treble is mostly clean but can be a bit harsh at times. The lows have good extension and quite a lot of punch for earbuds. Soundstage is better than with other ANC buds, so if you care about having that spacious sound, you’re going to like these. At the same time, you can’t expect perfect audiophile sound, but it’s quite close. If you want the best bang for your buck in noise cancelling earbuds, Audio-Technica ATH-ANC23 are your best choice. Before the review, you have to know that Sony MDR NC31E are only compatible with Sony devices that support noise cancelling technology, like Xperia smartphones and tablets (Z2, Z3, Z4…). You can also use these with any device supporting 5 pole 3.5mm output, but noise cancelling won’t work because it needs the on-board noise circuitry that only Sony devices have. If you’re not using one of these Sony devices, it would be better to look at some other noise cancelling in-ear earbuds. On the other hand, with an Xperia device, these earbuds work very well. According to Sony, these have up to 98% of noise cancelling. This is more than any other competitive models, though we still think Bose QuietComfort 20 have a clear advantage in this regard. With a good seal you should get a much cleaner and quieter sound, generally, noise cancelling in NC31EM works better than average (just with compatible Xperia devices). The great thing about Sony MDR NC31E is that they have no additional “box” with the noise cancelling circuitry like other ANC (active noise cancelling) headphones. This makes them more portable as you don’t have to worry where to put the box, which is more of a nuisance than anything else. Everything is taken care of by your connected Sony device, including all the controls. Turning NC on or off takes just a few taps. They also give you the option of adjusting the noise cancelling depending on where you are, you have the option of flight mode, bus mode and office mode. These work well, but only use them when appropriate. Additionally, you don’t have to worry about the battery life, as these have none. Just plug-in and play. The earbuds are made out of plastic with decent, rubberized, uneven length cable that is prone to tangling (left side is shorted than right side). The build quality is good, like most Sony products, but nothing special. You have to understand these are “lower-end” noise cancelling earbuds that cost under $100 so you can’t expect top-notch durability. If you plan on using these occasionally, for traveling like most people, then durability won’t be an issue. Just don’t expect to use them for very long if you make these your main, everyday use, earbuds. Check the most durable earbud models. When it comes to the fit and comfort Sony MDR NC31E aren’t bad either. The changeable ear tips play a crucial role in comfort. You can easily replace them with foam Comply tips if you want better comfort. They are comfortable enough for in-ear monitors, but can’t exactly compare to the most comfortable IEM models. The noise cancelling works because the microphones are built-in the earbuds themselves and the actual noise cancelling wave producing is handled by the connected Xperia device. There are no earbuds like these on the market right now and if you use Sony devices you can’t go wrong with these. The sound quality is pretty good. It’s more of a balanced sound, definitely not bass heavy. It’s what you would expect from $50 earbuds. Can’t compare to audiophile headphones and at the same time produce better sound than most $20 earbuds. You shouldn’t expect over the top sound quality since these are noise cancelling headphones after all, but it’s good enough to enjoy some music during a plane flight. 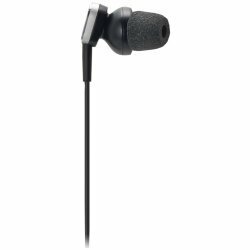 All in all, if you’re looking for affordable, noise cancelling earbuds and use Sony Xperia devices, the MDR NC31E are a very good choice. These are one of the cheapest Bluetooth noise cancelling earbuds on the market right now. TaoTronics TT-BH06 earbuds offer a lot of value for the money, but overall performance can’t compare to better, more expensive noise cancelling IEMs. Anyway, for around $20 you could call these “throw-away” earbuds since you won’t lose much if they stop working. Since we’re reviewing noise cancellation effectiveness in this article, we think these have the worst noise cancelling of all earbuds on the list. Not that it’s not there, it does work, but the level of cancellation is much lower than with alternatives. These are more a super budget in-ear headphones that also feature noise cancelling instead of being a fully dedicated noise cancelling earbuds. The only problem is, if you don’t want noise isolating earbuds or to spend $50+ then these TaoTronics are still one of the best noise cancelling options. With built-in battery that offers up to 5 hours of playtime you’ll have to charge them more often, but 5 hours is plenty of juice to use in one go. Just like with most budget products, durability isn’t very high. “Plasticy” casing is supposedly sweat-proof as these are also intended for sports, but it is not uncommon to have some durability issues. Here are best earbuds for running in case you want more sports oriented IEMs. Thankfully, TaoTronics customer service helps with that. If suddenly your earbuds stop working for no apparent reason, it’s very likely the customer service will replace it with a new one. You just have to contact them and explain the situation. Getting a proper fit takes some getting used to, since the earbuds have a built-in battery inside that makes them heavier. Finding proper ear tips will help with comfort and generally you can wear them for an hour or so before becoming irritating. Depending on your ear shape, some people find them very comfortable while others report a lot of falling out during exercise. Not all earbuds are made equal, but most of you shouldn’t have major problems with comfort or keeping them in ears. Featuring Bluetooth 4.1 you can connect them to any Bluetooth device. The range is standard 30ft without obstacles, if you put a wall in between expect half the range. This is just a limitation of Bluetooth technology, nothing that can be done about that. TaoTronics can use AptX technology for those of you who have the support on your music devices. This improves the Bluetooth sound transmission due to optimized compression, in other words, it has better sound quality. These also feature a built-in microphone that you can use for making calls. It works like it’s supposed to, with average sound recording. Sound is decent quality, but surprisingly good for the price. TaoTronics definitely won’t win any “best sounding budget headphones” awards, but for working out and listening on the move, these are good enough. You can find great cheap earbuds here. Or cheap over-ear & on-ear headphones. They have rather balanced ranges, so not much bass and if you’re a basshead, pick some other model. You can find the best basshead earbuds here. Overall, there is a lot of technology packed in a cheap and small package and if you’re not looking for top notch performance in every regard, TaoTronics TT-BH06 are great budget, Bluetooth earbuds. You can’t get more technology for a lower price. For more of the best headphone models, check other categories on the right. If you have great active noise cancelling earbuds that you want the world to know about and we haven’t reviewed them on this page, please let us know. You can either contact us through the website or just leave a comment below. Tell us why you think your favorite model is better so we can compare them to other NC models. To get future updates, like the page on social media or subscribe to website updates with the form on the left sidebar. Previous post: Best Bluetooth Headphones in 2017 – Are They Really Worse Than Wired?